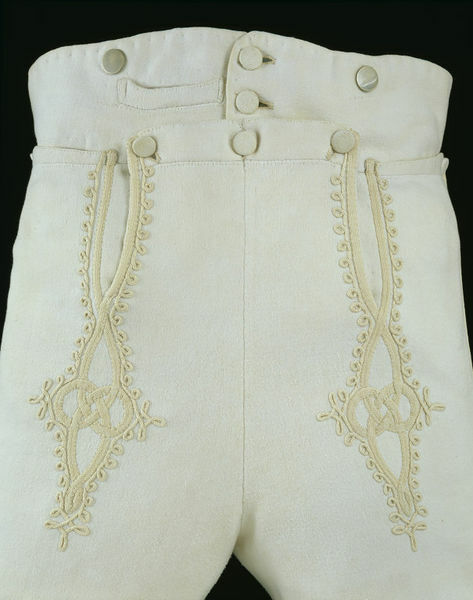 An intricate pattern of loops and applied braid decorates the front of this pair of pantaloons. Pantaloons were a form of close-fitting trousers or tights introduced into fashionable dress during the 1790s. They complemented the close-fitting lines of early nineteenth-century men's coats as they were shaped to the leg, often ending just above the ankle where the button fastenings or straps kept them in place. Although difficult to cut and put together without causing unsightly creases or wrinkles when the leg was moved, they could look extremely elegant. The tailor J.Golding extolled their merits in his publication of 1818: 'This is an article of dress very generally worn, and when made to fit well, are [sic] exceedingly neat and convenient, as they may be worn either with gaiters, boots, or over stockings only'. Pantaloons also brought the glamour of military uniform into men's fashionable dress, especially when teamed with Hessian boots. Uniforms worn by the various armies during the Napoleonic Wars (1793-1815) were often very colourful and lavishly adorned with braid and tassels. It is hardly surprising that some of these attractive trimmings should have infiltrated fashion, particularly when nationalistic feelings ran high. Civilian pantaloons were often ornamented with military-style braid that was applied in a vertical band of topside Russia braiding. They were not, however, generally decorated on the front, which suggests that this pair was for military use. The silk braid is applied in the form of an Austrian knot, which was a popular motif on pantaloons of the light cavalry such as the hussars and light dragoons. 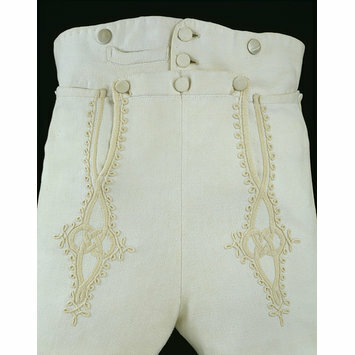 Pair of men's pantaloon trousers made of machine-knitted white cotton and decorated with cream silk braid applied down the sides and on the fronts. This imitates the hussar uniforms of the period and appeared on fashionable men's dress. The pantaloons are cut to fit the leg and button at the bottom with three buttons. The pantaloons fasten at the front with front falls buttoning over a five buttoned fly. There are two horizontal pockets at the front below the waistband and a fob pocket in the waistband. There are four metal buttons for braces, two at the front and two at the back. These probably are original. There is a cotton 'puff' at the centre back waist and two linen tapes for waist adjustment. Purchased. Registered File number 1986/371. The existing pearl buttons are not original to the garment.